First it must be said that in Eastern art the virtual is not destructive or negative for human culture, but that any search for a virtual quantity able to transcend purely realistic interpretations of the world, is conceived as a fundamental need for human culture. Already in this sense, the virtual element sought by eastern art is designed in a way entirely different from Virtual Reality flowing out of electronic communication. I will explain this through a more detailed comparison of Noh, icons and Virtual Reality. (1) All three create a space and a spatial experience that is determined by a strong psychological component, thereby effectuating a shift in mental awareness. (2) They strive to establish a realm outside the physical framework of space-time and of matter. (3) They claim to need no ontological basis for the reality they create since they are able to provide this basis on their own. Still, there are essential differences between two types of the "virtual." In the following paragraphs I will exemplify these differences with the help of an analysis of the virtual element in Noh-plays, from which the qualities revealed are also valid for icons. First, what distinguishes the virtual reality of Noh-plays from common, technological VR, is that the latter follows the principal lines of Western aesthetics and attempts to establish an alternative kind of "virtual realism" by means of logic and reason. Zola�s approach of capturing "life itself" is based on the "reasonable" approach of attempting to reproduce reality. It is opposed to "Romantic" ways of grasping the world based on personal feelings and other subjective components. However, even when reality is perfectly "represented" to the point that it appears as absolutely real, the fact to re-present something cannot escape subjectivism. What Zola can be reproached with represents also the weakest point of computerized Virtual Reality. Heim�s points are interesting for the present discussion. Heim has done extensive work on the philosophical constellations underlying the phenomenon on Virtual Reality as well as on its social and psychological effects. In one article he opposes the quietness and serenity inherent in the Japanese Tea Ceremony to the "culture of explosion" and of speed produced by Virtual Reality. He elaborates some of the typically Japanese qualities of the Tea Ceremony as patience, ceremonial gentleness, refined rhythmic sensibility, and suggests to redesign "virtual experience" according to this model. Heim�s idea is original and daring but, curiously, he fails to consider the moment of "virtuality" inherent in the Tea Ceremony itself that provides the essential impetus for the "shift of perception" produced by this Japanese art form. Because of its spatial quality, I prefer to stick to the Noh-play and leave the Tea Ceremony aside. Some people conceive of Virtual Reality as an empty space able to grant its inhabitants a potentially high degree of self-expression. Because this space is removed not only from everyday matter but from matter as such, an apparently absolute freedom remains unaffected by coincidences linked to the impact of material "reality." Therefore, in cyberspace, any action can reach an exceptionally high degree of necessity. Things function here very much like on an empty theatre stage. Peter Brook has shown that when the stage is empty, even the slightest action occurring within this empty space adopts an absolute character. Similarly, for many people the idea of "cyberspace" is fascinating because the elements created within this empty space can, theoretically, acquire a state of "absoluteness." We are here close to the Noh-play not only because the stage of the Noh is extremely sober and appears as rather "empty,"  but also because the space of the Noh-play is determined by a Buddhist concept of "emptiness" or Nothingness. Emptiness or Nothingness projects us into a realm that is absolutely free of everyday matters. As mentioned, Mahayana-Buddhism (by which Noh is influenced) recommends the abandonment of all "images" inscribed in the sphere of appearance. However, neither Mahayana Buddhism nor Noh would hold that the access to the "other" sphere (that is more "real" than the shadows on the Platonic cavern wall) would lead to the true knowledge of reality. For Mahayana Buddhism as well as for Noh, the alternative of appearance is "emptiness." It becomes particularly clear here how much Western theatre as well as cyberspace remains linked to the Platonic philosophical tradition. However strong their tendencies towards "emptiness" may be, in the end they must fill the empty space with "something" (be it at least an idea or a concept) in order not to be infinitely boring. In contrast to cyberspace, Noh is anxious to keep its theatrical space absolutely empty. Only the persisting state of emptiness guarantees this theatrical space the status of a form of "reality" that I have termed above "virtual irreality." This constitutes the main difference between Noh-space and cyberspace: the purpose of the Noh-play is not to install, within its "empty" space, "real" things in order to create a reality, not even a virtual one. On the contrary, the reality of the Noh is supposed to remain empty in the sense that the "things" it presents are shadows of the nothingness which normally has no form but has become visible within this virtual sphere of irreality. In other words, the space containing these "shadows" is virtual because it is not supposed to represent anything, not even a newly invented reality. Or, in more concise technical terms: the Noh-play presents emptiness, while computerized Virtual Reality represents reality within a realm of - extra-temporal, extra-spatial - emptiness. This refers us to the subject of illusion as it has appeared in the analysis of icons. Surprisingly for Western observers, the hanamichi or hashigakari custom negates any effect of illusion. This is consistent, because "illusion" is not what is going to be presented. The only thing that is, is the presentation of an irreality for which "reality issues" like identity, immersion, or participation do not exist. The use of the hanamichi signifies thus the conscious acceptance of otherness, separation, and dislocation. This means that "virtual irreality" created in Noh thwarts all attempts of identification, be it those related to reality and those related to illusion. What remains is the paradoxical coexistence of unreal-consciousness and self-awareness providing an aesthetico-existential experience able to distill a non-materialized, "virtual" atmosphere within human experience. Most works on "icons and space" concentrate on the phenomenon of perspective. I have no intention to discuss this phenomenon here in detail but will directly place it in the context of the aforementioned ideas on the "virtual space" of icons and Noh-plays. Of course, in perspective and non-perspective paintings the respective internal relationships of representation are different. Linear perspective shows the represented object from a central point of view of an individual as if s/he were looking through a window. Linear or central perspective rationalizes and homogenizes space because, as Erwin Panofsky has said, it does not accept a given space as it is, but produces space through construction. While Western aestheticians tended, for some time, to disqualify iconic art as "unable" to create perspective (Gombrich) , at least since Panofsky and Francastel it has become commonplace to admit that the Western art of representation is in no way superior to the non-perspective one of icons. Both ways are acceptable styles of representing reality. It goes without saying that the same "methods" are also used in Noh-play. In Noh, the actor often speaks facing the audience, though his interlocutor might be behind their back. This effect is even more important in the more humorous Ky�gen-plays  where the effect observed by Uspensky in icons is very common. When starting a dialogue, the Ky�gen actors face each other, but will soon turn their faces towards the audience and present the rest of their speech. It is well known that in historical Japan, perspectival construction of representation was, while not absent , not well developed. Even today theoreticians of architecture and urbanism do not cease pointing out that the feeling for perspective in Japan is not as much developed as it is in the West. In this sense, the discovery of a common lack of "perspectival thinking" in Japanese and Russian traditional art is not surprising. What is interesting, however, is that in Noh-plays a kind of a-perspective perception has some formalization. This happens through the introduction of a secondary actor (deuteragonist) called waki. The waki is a "bystander" who has no particular role to play with regard to the action�s plot, but whose permanent and silent presence next to the waki pillar (wakibashiro) on the front of the right stage (which is named after him as the waki-stage or waki-j�men) is important. Normally the waki comes in, briefly presents himself, sits down and says, for example, that he has been or will go on a journey. Occasionally he may interfere in the play by giving comments or explanations. However, what is much more important than the actual dramatic input he delivers is the fact that though his existence the play can be perceived as seen through him. The events on the stage are events that he experiences. Yet, interestingly, the waki does not view these events himself but rather stays fixated on the audience. The result is not only that the waki appears as the intrinsic producer of the time of the play (he condenses the time of the "real" event). He also produces a space that is no longer real space (seen from the realistic perspective of the audience), but a space that has lost its actual reality. Still this space is not simply subjective or psychological because the waki is not a narrator. A virtual character of this reality is obtained through the use of a peculiar a-perspectival model of space, which denies the existence of any logical or linear link between the waki and the events happening on the stage. I want to claim that the latter illusion-like spatial representation of a � fantastic ,� though at the same time � purely logical � world widely overlaps with what we today call "Virtual Reality." It could also be called a "secularized virtual reality." P.A. Michelis found that the � infinity � as it was thought by Renaissance, was not a religious infinity but represented the � materialized infinity � of science. The same can be said about today�s Virtual Reality. The computer continues with utmost efficiency the Renaissance tradition of � materializing infinity � by turning virtual irreality into virtual reality. Appearing as the prototype of a � window to celestial realms, � the computer seems to reinstate Renaissence laws of perspective in an almost charicatural way (objects are obligatorily seen from a fixed point as if through a window, and from there the view goes towards � infinity �). In Noh also, there are cases of representation of non-being, expressed through the coexistence of dream-consciousness on the one hand, and conscious self-awareness on the other. First, there is the aforementioned aesthetic quality of y�gen which, according to Richard Pilgrim, "functions as a scrim, a haze, or dream through which the numinal is vaguely sensed (...) point[ing] beyond itself to a sense of reality veiled by, and not confined to, the phenomenal world." Pilgrim�s definition of "y�gen as dream" contains perhaps a little too much "veils" and "haze." It is true that Noh undertakes a "deepening the feeling of y�gen by avoiding overly realistic depiction." (Komparu, p. 160). However, as for the icon, the dream produced must be clear and simple, not foggy and complicated, if it strives to be sublime (or to manifest y�gen). The non-materialized, virtual atmosphere of Noh can also be seen as that of dream. This aesthetic insight led not only to the development of y�gen, but also to that of the mugen type of Noh, a type directly aimed at the presentation of fantasy, of phantasm, or of dream. Here, the above mentioned paradox is explicated. The "bridge" between stage and mirror room will be used, in this dream-type Noh, even more intensely. The virtual reality produced through Noh-like dream irreality is obtained by radically renouncing the status of reality as such - including that of a dream reality - and by placing the Noh-dream into an "in-between" of reality and non-reality. Through this mechanism all Noh types, not only the mugen Noh, can acquire a dreamlike character. This does not mean that they would represent elements that the observer would likely classify as "dream." Rather, they present something non-material: a style. Furthermore, the presentation of this style is mediated only through the style of the Noh. When style appears (since it has no "reality" that it could re-present) as a reality that presents nothing but itself, the Noh-play becomes an event that adopts a fundamentally virtual character. This is neither realism nor anti-realism but a kind of virtual irrealism in which "imitating and becoming" have been united. Virtual Reality here is not a matter of seeing but of feeling. "Feeling" is not understood as the subjective experience imposed upon the human consciousness or even upon the unconsciousness through the effects of, for example, the cultivated realism of the "culture of explosion." On the contrary, the Noh-actor (as well as the spectator) are "carefully warned against indulging in his own emotions as well as using a technique to manipulate them." (Yamazaki, p. xlii) The feeling that arises through the confrontation with a virtual irreality is rather a "normal" feeling that at times turns towards the unheimlich since we approach an irreality through the same psychological state in which we normally approach the real. Dream thus becomes one experiential quality with which we can - metaphorically - capture the character of this virtual irreality. The quality of style is yet another one. Finally, it is only through stylized presentations (which are presentations of style), that Noh captures an impression of reality, which appears natural even on the deepest layers of its aesthetic existence. In no case does it create a second reality representing things that would exist only "here" and not "elsewhere." In this way Noh attains a moment of virtuality. The present article demonstrates that both the Noh-play and the Russian icon capture the "beauty of life" (including all existential moments that are also contained by ordinarily life) not directly, through realistic representation, but indirectly, through their styles of representation. What is presented is not a presence but rather what Derrida would most likely call an �criture. In Noh "the written, mute-optical element has priority," wrote Hermann Bohner. And, significantly, in Russian language one does not say that an icon is "painted" but that it is "written." It is tempting to suggest that the images of Virtual Reality have an essentially "phonological" character. By this is meant that VR lacks the "silent" stylistic capacity that Noh and icon have. With regard to style, VR chooses a process diametrically opposed to that of Noh or the icon: It stylizes an existing reality and is therefore the re-presentation of a stylized reality. Alternatively, style for the Noh-play as for the icon, is not simply an outspoken stylized form, or, as Masakazu Yamazaki asserts, it is not "a fiction." (p. xxlv) Noh and icon simply (silently) present style in the form of a virtual world. There is no manipulation of stylistic form, or of time and space, but virtual reality presents itself as a whole within which experience is "neither contradictory nor disjoined"  Style does not exist because some reality has been stylized; and "purity" (of experience or expression) does not exist because something "impure" has been purified. This is inexplicably linked to the particular character of the stylistic reality transmitted through a paradoxical fusion of two opposing states of human consciousness: dream and reality. As a matter of fact, style is never "really" existent, but has a profoundly non-realistic nature. Expressed differently, style is always of virtual quality, virtually (and silently) present in the sphere of reality, but perceivable only through a state of consciousness elaborated in accordance with the style about to be perceived. A "realistic" consciousness will not see this style. A "sleeping," non-realistic consciousness blinded by illusions, will not see it either. The sphere between sleep and being awake is, of course, dream. For this reason, the style-perceiving consciousness in Noh-plays and icons is developed along the lines of a consciousness that is dreaming. 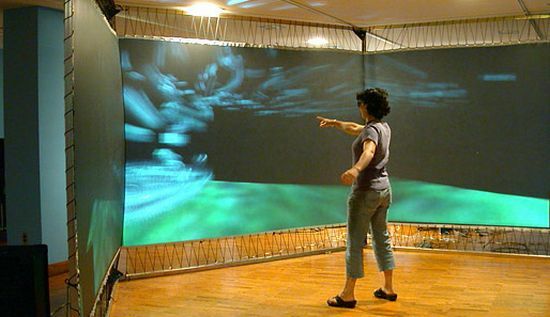 Computerized Virtual Reality must be seen as "realistic" for the same reasons. In VR the spiritual style so essential to Noh-plays and icons, cannot be transmitted. Hermann Bohner: Noh (Tokyo: Deutsche Gesellschaft f�r Natur und V�lkerkunde, 1959), p. vii. Michael Heim: "Virtual Reality and the Tea Ceremony" in J. Beckmann (ed. ): The Virtual Dimension (Princeton: Princeton Architectural Press, 1998), p. 172. Brenda Laurel: "Virtual Reality Design: A Personal View" in S.K. Helsel & J. Roth (eds. ): Virtual Reality: Theory, Practice and Promise Westport & London: Meckler, 1991), p. 95. Kabuki is a more popular entertainment including, like Noh, music and dance. In Noh the bridge is separated from the audience (like the main stage) through a gravel surround. In Kabuki, on the other hand, such a separation does not exist and audience and actors share the same world. Erwin Panofsky: Perspective as Symbolic Form (New York: Zone Book, 1991), p. 30. Ernst Gombrich: Art and Illusion: A Study in the Psychology of Pictorial Representation (London: Paidon, 1960), p. 125. Byzantine art declined at the end of the so-called "Paleologian period" (1261-1453) just because "Western-style realism" had started to enter its aesthetics. As writes Kurt Weizmann: "While the East thought greater abstraction, western European art, from the beginning of the Gothic period, developed in the direction of naturalism that was incompatible with the spiritual concept of the icon." Kurt Weizmann: The Icon (London: Evans, 1993), p. 9. Ky�gen is a comic interlude played during the Noh. In Chines and Japanese drawing between the 12th and 17th century one can find a highly developed art of linear perspective. See the hanging scroll by Du Jin: Enjoying Antiquities (15th century, National Palace Museum of Taipei ) and Tosa Mitsunobu�s Legends of the Founding off Kyomizu Temple (handscroll, 16th century, Tokyo National Museum). Cf. G�nter Nitschke: "From Ambiguity to Transparency: Unperspective, Perspective and Perspective Paradigms of Space" in Supplement of Louisiana Revy 35-3, June 1995: "It is an unperspective or preperspective paradigm of space which unconsciously lingers in the minds of every average Japanese. The problem how to identify a space in the 3rd dimension did not arise in traditional Japanese cities since they did not develop a third dimension." A similar function has the so called Iconostasis: "Separating the Sanctuary from the Nave (the Divine from the human) the iconostasis, just as did the ancient screen, points to their hierarchic difference, the importance and significance of the sacrament, which takes place in the Sanctuary. At the same time it indicates, like the ancient screen, the connection between the two worlds, heaven and earth, and it reveals this connection pictorially, showing in a concise form, on one plane, immediately before the eyes of the congregation, the ways of reconciliation between God and man..." Uspensky & Lossky, p. 67. It is also notable that some Orthodox theologians conceive of the Holy Spirit itself as of a "spatial event," as does for example father Boris Bobrinskoy, rector of the Alexandre Nevsky Cathedral, Paris: "Saint Basil parle de l�Esprit Saint comme de l�espace, dans un sens ascendant, de l�espace de l�adoration. L�Esprit Saint est le lieu - le milieu divin comme dirait Teilhard de Chardin - , de milieu dans lequel seul peut se faire, non seulement l�adoration, mais la vision. Il est cette luminosit� sans laquelle il n�y aurait pas de transmission de l�objet lumineux vers notre �gard. Voil� pour l�aspect ascendant." "Mais l�espace est aussi objet descendant, car l�Esprit Saint est non moins le lieu et l�espace de la sanctification. Donc, vous voyez: espace d�adoration, de contemplation, de vision et de communion bien s�r, espace de fortification. Donc l�Esprit Saint est ce lieu dans lequel s�op�re cette relation de r�ciprocit� et de dialogue" "L�Ic�ne: Objet d�art ou de culte?" in: Saint Jean Damasc�ne: L�Ic�ne: Objet d�art ou objet de culte? (Paris: Cerf, 2001), pp. 41 and 42. "Icon" in Grove Dictionary of Art (New York: Macmillian, 1996), p. 76. Kwadensho III. Kwadensho or Fushikaden (The Book of Flowers) is called the collection of Zeami�s writings on Noh technique and aesthetics. Engl. translation T. Rimer (ed. ): On the Art of the N� Drama: The Major Treatises of Zeami (Princeton: Princeton University Press, 1984). See also Benl�s German translation (note 18). For this quotation see also Bohner p. 75. Panayotis A. Michelis: An Aesthetic Approach to Byzantine Art (London: Batsford, 1964), p. 201. Kandinsky quoted from Onasch, p. 281. Richard Pilgrim: "The Artistic Way and the Religio-Aesthetic Tradition in Japan" in Philosophy East and West 27/3, p. 294. Masakazu Yamazaki: "The Aesthetics of Ambiguity: The Artistic Theories of Zeami" in T. Rimer (ed. ): On the Art of the N� Drama: The Major Treatises of Zeami (Princeton: Princeton University Press, 1984), p. xliii. Kunio Komparu: The Noh Theatre: Principles and Perspectives (New York & Tokyo: Weatherhill, 1983), p. 77.